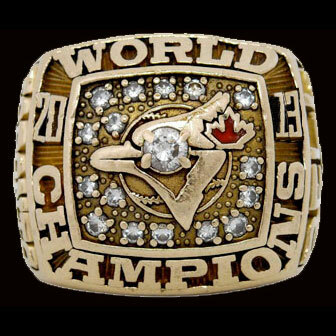 It's been 20 long years since the Blue Jays came anywhere close to making the playoffs. And 2012 was the most apocalyptically terrible of them all. After getting off to a promising start in swanky new retro uniforms, the team was devastated by injuries. First the pitching staff went down and then the line-up. By the end of the season, they were practically fielding a minor league team. Things went downhill from there: shortstop Yunel Escobar took the field wearing a homophobic slur on this face and then manager John Farrell revealed that he'd spent the whole season wishing he was somewhere else, requesting a trade to his "dream job" at the helm of the Boston Red Sox. 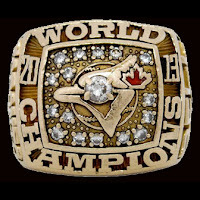 It put the finishing touches on what most people agree was the most depressing season in the history of the Blue Jays. A few weeks later, things couldn't be more different. The Blue Jays are now listed in Vegas as the odds on favourites to win the World Series next year. Fans are giddy with excitement. Farrell and Escobar are gone. And in their place, Jays fans have a whole new slate of stars to cheer for. Ninja/silent assassin/Blue Jays general manager Alex Anthopoulos has overhauled the team since the end of the season, turning them into legitimate contenders who are now expected to make the playoffs next year. He began by essentially trading Escobar and some minor league prospects to the Marlins for a giant haul: Jose Reyes (easily considered one of the best shortstops in the game), Josh Johnson (the starting pitcher with the lowest Earned Run Average in the National League just a couple of years ago), Mark Buerhle (an above-average starter who is also a veteran workhorse, having pitched more than 200 innings in 12 straight seasons without getting hurt), and Emilio "Boneface" Bonifacio (an exciting, fast, versatile infielder and outfielder who can come in off the bench or fill in for injured players). He followed the trade by signing the National League's batting champion from last year: Melky Cabrera. He came cheap thanks to the question marks raised by a suspension for steroid use, but is expected to be an excellent (and possibly spectacular) left fielder. Something the Jays definitely needed: they haven't had a consistent solution there since Joe Carter's home run sailed over the fence. Now, Anthopoulos has pulled off another major coup, trading prospects for last year's National League Cy Young Award winner: R.A. Dickey. He is the only pitcher in the Majors who currently throws a knuckleball — a pitch so weird and crazy and difficult to harness that only a few pitchers have ever been able to throw it effectively. And he throws two of them — one of them much faster than anyone has ever seen before. He made hitters in 2012 look just plain silly. They struck out against him more than anybody else in the league. And since the pitch floats through the air with the least amount of spin possible, many suggest that he could do even better in the stale, lifeless air of the SkyDome. With Dickey leading the way, the Blue Jays may very well have the best starting rotation in all of baseball. Hell, they may very well have the best team.